We finally decided to break our routine of laziness. 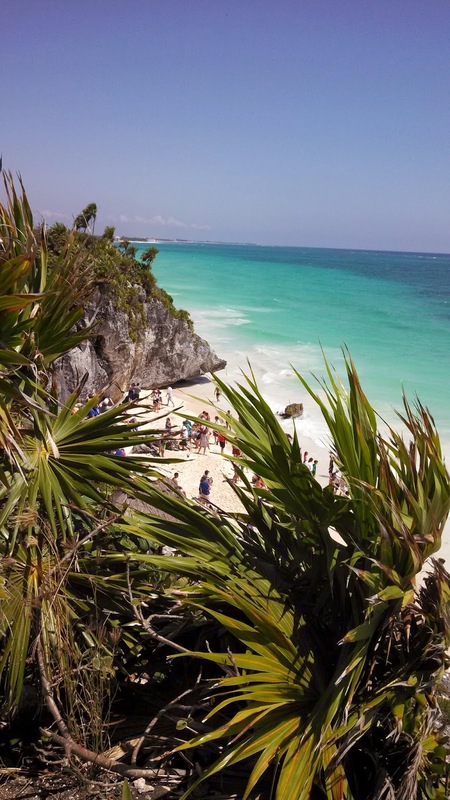 I booked a trip to Tulum, Coba, and a Cenote. 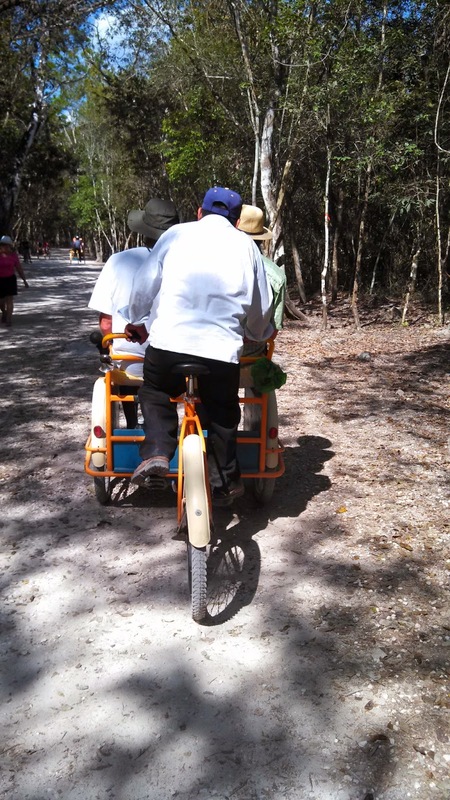 The van picked us up at our doorstep at 7:45 am., and off we went through the Maya Jungle. First stop, Tulum. These Mayans knew how to pick oceanfront property. It was a booming city of about 10,000 (I think I remember it right). A small contingent of ten Spaniards landed on their beach, and were greeted by a thousand 4 ½ foot-tall vicious Mayan Jaguar Warriors. They were covered in tattoos, piercings, had teeth filed into points, and were armed. The chief broke the custom ripping their hearts out, peeling their skin off and cremating them (the hearts were saved for the priests to eat in front of everyone). He decided to parade his captives around to the other villages to show his fierce power, so off they went. Unfortunately the Spaniards were armed with biological warfare. A year later when the next group of Spaniards arrived, there were only about four hundred Mayans left. They’d died of small pox, and the flu. We made a stop at a typical Mayan home to taste homemade tortillas with some sort of strange tasting paste smeared on them. The tortilla was good J I went outside and chatted with the man of the house. 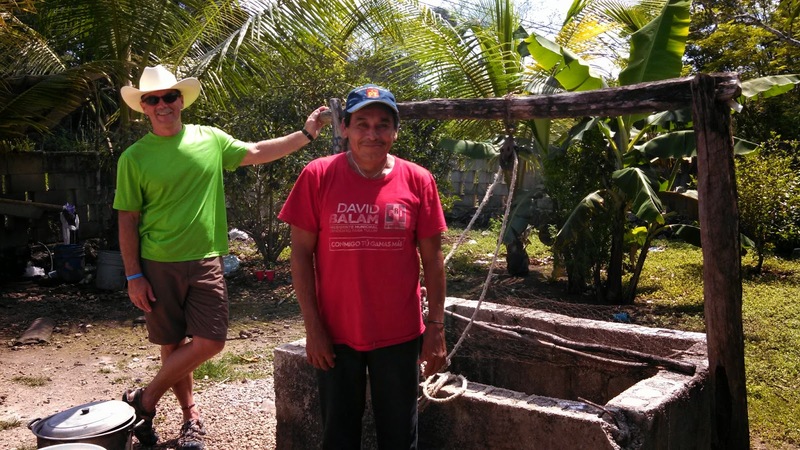 He showed me his well, which didn’t need to be very deep to tap into the underground rivers. Next we went to Playa Paraiso. A gorgeous beach. Everyone jumped in and cooled off. We went to a restaurant on a beautiful lake. No one was swimming in it, so I asked our driver why. 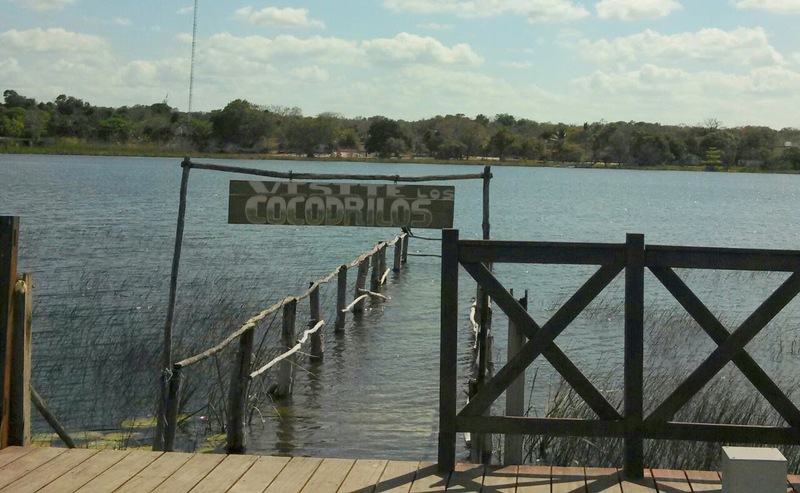 He pointed at the lake and said “Crocodiles!” Ahh, that makes sense. Next stop, Coba. I wasn’t familiar with this ruin. It’s deeper in the woods. We took bicycle taxis a mile to get to the center. Coba had a population of about 55,000. They have a couple of pyramids. The big one is open to climb, so we did . . . meaning Bill and I. There was no way Joe was going up that thing. I don’t know if you’ve ever been up a pyramid, but the steps are twice the height of normal steps and shallow. 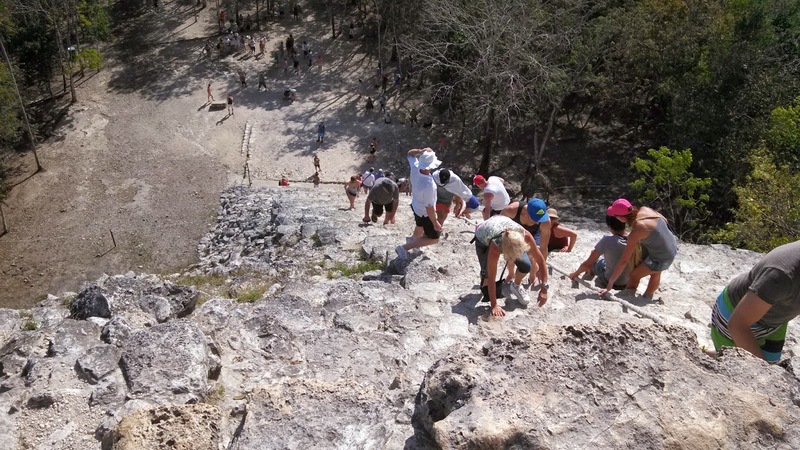 Going up the 120 steps (average lifespan of a Mayan) was a gasping chore. Coming down was downright scary, especially because the steps are worn smooth from tourists. I went to the side for a little better traction. 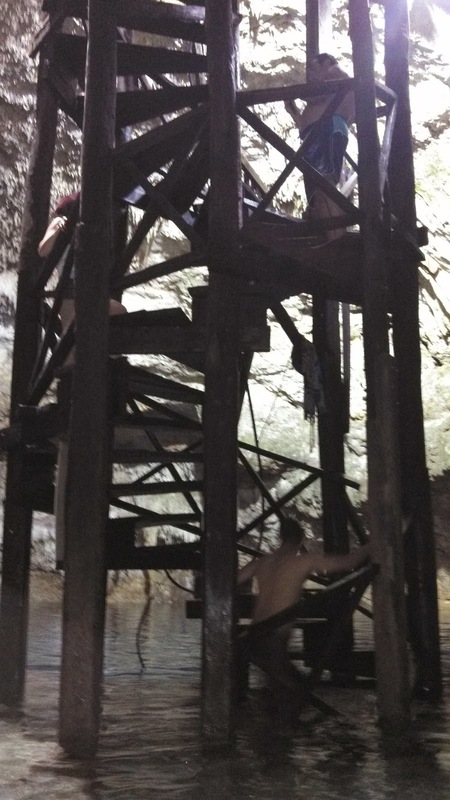 From there we went to a Cenote. I don’t remember the name. Cenotes are basically areas where the thin crust of limestone earth collapsed from the weight of the trees. 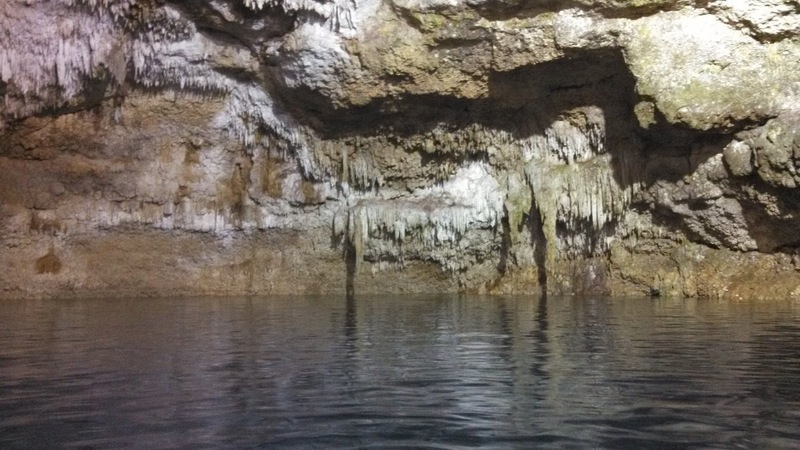 The Yucatan Peninsula has a massive complex network of caves and tunnels filled in with fresh water. Some cenotes are huge, some are barely big enough to squeeze through, but they are all interconnected via waterways. Another spectacular feature of these rivers is the submerged stalactites and stalagmites. This one is small, though deep. We had to rinse off before getting in to protect the clean water from our chemical slathered bodies. More stairs to struggle up to get out. We finally got home around 6:00 pm, and oh joy, climbed four flights of stairs to our room.